The early United States was a culture of the episode. In Episodic Poetics, Matthew Garrett merges narrative theory with social and political history to explain the early American fascination with the episodic, piecemeal plot. Since Aristotle's Poetics, the episode has been a vexed category of literary analysis, troubling any easy view of the subsumption of unwieldy narrative parts into well-plotted wholes. Garrett puts forward a new, dialectical theory of episodic form to recast this peculiar object of literary history, looking to the episode as a narrative unit smaller than the genre in order to give an account of all the period's major prose genres. Garrett shows how, in ways both magisterial and mundane, episodic forms gave variegated shape to the social, political, and economic conflicts that defined the moment of national formation. Episodic Poetics proposes a new method of reading and a new way of conceiving of literary history. The book asks how we might understand the cultural role of the episode as a literary micro-unit, one that forces us to read individual narratives in terms of an always partial and fraught development toward plot. 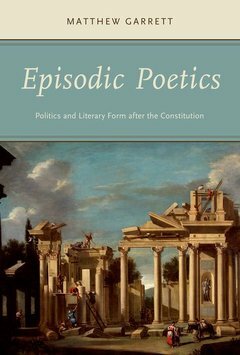 Episodic Poetics combines theoretical reflection and historical rigor with careful readings of texts from the early American canon such as The Federalist, Benjamin Franklin's Autobiography, and the novels of Charles Brockden Brown, along with hitherto understudied texts and ephemera such as Washington Irving's Salmagundi, Susanna Rowson's Trials of the Human Heart and the memoirs of the metalworker and failed entrepreneur John Fitch. Garrett recounts literary history not as the easy victory of grand nationalist ambitions, but rather as a series of social struggles expressed through writers' recurring engagement with incompletely integrated forms. Matthew Garrett is Assistant Professor of English and American Studies at Wesleyan University.